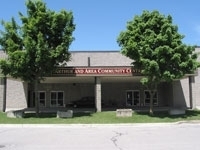 The Arthur & Area Community Centre opened in the fall of 1977 after their former arena was condemned. It has a 185’ x 85’ Ice Surface / Arena Floor with a large area for spectators, 6 change rooms, and concession booth. In addition there is a large hall with capacity for 500, perfect for trade shows, weddings and dances. Many of the church groups and agricultural society use this hall for their fundraising suppers. The kitchen is equipped with a large gas stove, walk-in cooler, an industrial dishwasher with fully stocked cupboards. Just add food. The second smaller hall has a capacity of 160 which is Accessible by elevator or stairs. It also has a well equipped kitchen for events of all kinds. Book your meeting, birthday party or family dinner.